State Bank of India, SBI has released the admit cards for Pre-Exam Training. The admit cards are available on the official website. Check steps and other details. 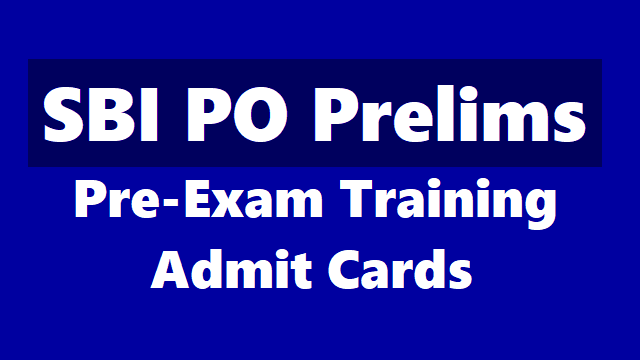 State Bank of India, SBI has released the admit cards for Pre-Exam Training. The admit cards are available on the official website. Candidates who have registered for the SBI PO examination can download the admit cards from the official website sbi.co.in. The steps to download are provided below along with a direct link. SBI conducts the PO Examination every year around the month of July. The recruitment process includes a three-step process which includes Preliminary examination, Main Examination and an Interview. Following the examination process, the bank would release a provisional allotment list. Important dates are provided below. Candidates can check the important dates. Also, all the candidates who are appearing in the examination must carry their admit cards in the examination hall. No person will be allowed to enter in the examination hall without admit cards. The SBI PO applications were started from April 21, 2018, and were ended on May 13, 2018. The Online Prelims call letter will be released on June 18, 2018, and the Online Prelims Exam will be conducted on July 1, July 7 and July 8. The Result for the Prelims will declare on July 15, 2018. The main exam’s admit card will release on July 20, 2018, whereas the main exam will be conducted on August 4, 2018. The result for the main exam will declare on August 20, 2018. The candidates who will be selected will be called for an interview and the interview call letter will be released on September 1, 2018, and the interview will conduct in between on September 24 to December 10.